Summary: Cast out of her family three years ago, Mara turned to the only place that would take her—a school where students train to protect others. But Mara is stunned when guarding a noble girl in the Empire’s capital turns out to be more dangerous than she could’ve imagined. More shocking still, she finds the boy she thought she had lost forever outside the gates of her new home. 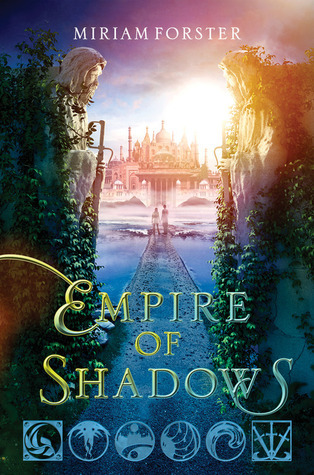 Review: Empire of Shadows, which is the second book in the Bhinian Empire series, is actually a prequel to City of a Thousand Dolls, the first book. Nevertheless, Empire of Shadows actually stands on its own, both in the reader’s ability to understand how this world works and in telling its own, complete story. (There were far fewer infodumps in book two, which I appreciated.) Once I finished Empire, I picked up my copy of City and skimmed through the last fifty or so pages, and it was a delight to see how the stories meshed. Empire has two POVs: Mara and Emil. Both narrators are interesting on their own, and I particularly enjoyed that, after their chance encounter, they both continued on with their own plots. When those plots (two different vantage points on the same conspiracy) converged later in the book, it was satisfying to see them reunite and do their best to handle what was going on. Both Mara and Emil were compelling characters, and I enjoyed their interactions and relationships with the people around them. Mara and Revathi’s slow-developing friendship is of particular note, and I really enjoyed Emil’s complicated relationship with his brother, Stefan, and their contentious relationship with their father. Esmer was a very fun character as well, and her friendship with Emil was a great addition to the story. The romance between Mara and Emil was all right, though I wish we had gotten more of them together before they were risking their lives for each other. Nevertheless, I do appreciate that they both trusted each other to take care of their own life-or-death problems. I didn’t have many complaints with the book, though there were a few. As with City, I will note that I felt that some of the plot twists were telegraphed. While the villains’ motivations made sense, I didn’t find them particularly interesting. Aari was terrifying simply because she was a powerful threat, but Tamas was one-dimensional. They were both obviously trouble, and that made the discovery of the conspiracy less exciting than it could have been. Recommendation: Get it soon if you are a fan of the series. While you can read Empire before City, it will spoil many parts of the mystery in City if you do. While some parts of the plot are predictable, the main characters and their relationships are really the highlight of this book. It’s a solid installment for the series, and I’ll be looking forward more in the future.